Are you paying someone else's mortgage? Why use your hard-earned cash to pay the landlord’s mortgage when you could be using the rent money to buy a home of your own? That’s a question many people ask themselves when they start thinking about moving out of the rental market to home ownership in one of the best buyers markets in 45 years. It’s a big step. For most people, taking out a mortgage is the biggest financial commitment they will ever make. But buying your own home has always made sound financial sense. 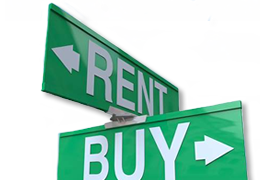 Here are some facts to think over when considering home ownership as opposed to renting. If you are 35 now and just buying your first home, you will likely be mortgage-free when you are 60 and sitting comfortably on a considerable asset. It’s highly likely your investment will appreciate considerably in 25 years. It’s important, however, not to buy with the intention of making a quick fortune. Think of home buying as a sound, long-term investment. Buying a home is a very effective way of saving regularly over many years. Even if you never buy into another retirement or investment plan, you are effectively putting money away for the future. Owning a home of your own means you and your family can set down roots, get to know your community and involve yourselves in it. Discover the pride of home ownership. You can fix the place to suit your particular needs. You can also have pets in your home. If you are planning to borrow money from a bank or other financial institution, owning your own home is a definite plus when it comes time to negotiate. With many kinds of investments, you have to pay a capital gains tax on profit you make. If your home is your principal residence, this tax does not apply. We would like to prepare a customized list of properties for sale (sign up here) that best meet your needs, wants and budget. Jason and his team can also use their knowledge and experience to provide valuable assistance and guidance to you throughout the buying process. Whew. That was exhausting. But you're done! Well, sort of. You've closed and moved in, but now you'll need to protect your investment for years to come. And you can do so by performing routine maintenance on your home's systems, depending on their age and condition. A good rule of thumb is to watch for signs of leaks, damage, and wear. If you fix small problems early, you will save yourself from having to spend big money later. And remember that kind real estate professional who assisted you throughout the process? Well, after closing your agent can still help you with such things as providing information for your tax returns, finding contractors and repair services, and even tracking your home's current market value.